The MARLEN-trucktable with the quality seal! such as. this folding table for the MAN TGX and TGS series. Because of a production fault of our supplier it could happen that the glue of the Velcro-Strip could fluidise because of too much direct sunlight. It could happen that truck tables will come loose. We recommend to check the save adhesion of truck tables before overturn the drivers cabin for repairs. Change the soft velcro strip if it is loose from dashboard. Affected truck tables were produced some month ago but we cannot say exactly when this production fault of our supplier has happened. We strictly recommend to check the secure grip of your truck table before overturning the drivers cabin. Please contact us even if customers will tell you about the above problems. We will replace the faulty material for free, asap. stainless steel coffee pot. 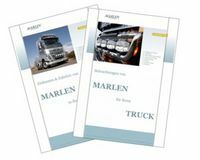 MARLEN-spare part-service. Also in a color-combination with window curtains, interior curtains, seat covers, foot mats, bedcovers and engine tunnel covers.